Reputation has different meanings to different people- for some it is the capacity to yield good results regardless of the means, for others it is the popularity of the school itself which makes it highly recommended. But reputation, in general, is a good gauge as to how popular the name of the training school and the appeal of the training methods it uses. It also reflects how many people have trusted on them. To find a school with excellent reputation you could ask around or search through websites. Veterinarians usually have several names of schools and trainers to give you, your dog breeder could also provide you with some references and ASPCA or the American Society for the Prevention of Cruelty to Animals can provide a list of registered names that are sure to use humane methods approved by the organization. Any self-respecting training school uses responsible dog training methods. The school must have equal concern to your dog as you do, treating your dog one of their own. Beware of schools that employ trainers who still use old training methods such as yelling or hurting the dogs for there exists many of this kind. 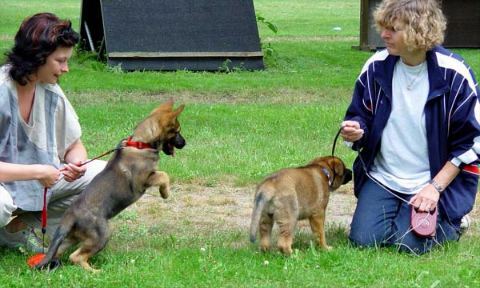 The knowledge on training of the schools must range from the oldest unreliable method to the latest training techniques for dogs. Having extensive orientation in this field would optimize the capacity of your dog to learn since it would be exposed to all possible trainings to which it could respond well. In researching for training schools, secure information regarding the latest seminars that the trainers attended to and the up-to-date facilities they have. Remember that you would pay hefty amounts to get your dog trained, it is but proper that you and your dog receive proper compensation for your investment. Another thing that you should keep in mind is that the school's exposure to widespread training. There are schools that claim of specialization while others advertise that they have sufficient knowledge on all fields of dog training. Your choice should depend largely on the scope of knowledge the training school has. There are two types of classroom set-ups- group classes and private lessons. The main advantage of the group class is that it promotes socialization and good behavior in the presence of other dogs. Also, when the owner trains alongside his dog, the owner could benefit from exposure to other handlers' mistakes and techniques. On the other hand, private trainings could not yield these advantages. There is also a good chance that the transfer of learning and obedience to command given by persons other than the trainer is poor. It is easy to pick any dog training school but choosing the right one for your dog could prove to be a tedious process.